Las Vegas Bus Sales has some tips on how you can make the most of tailgating with a bus. Arrive at a football game early to get a prime position in the parking lot. If you show up to tailgate at a football game an hour before the start, you’re likely going to find a full lot. And if you do find somewhere to park your bus, it’s likely going to be far from all the tailgating action. Make sure you show up for games at least three or four hours ahead of time, if not sooner. Doing so will allow you to park your bus in a great space to tailgate with fellow fans. Use the extra storage space on a bus to bring everything you’ll need to tailgate. The great thing about using a bus to tailgate is that you can store so many things on it. You can bring as many coolers, tables, chairs, grills, and games as you want on your bus! 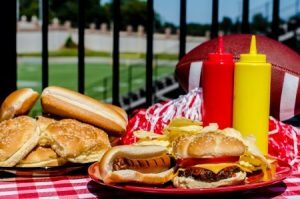 Start preparing to tailgate at least a few days ahead of time so that you don’t forget to bring anything with you on the bus. You have more than enough room to put it all, so take advantage of it. Consider hiring someone to drive your bus for you when you’re tailgating. Are you planning on enjoying adult beverages while you tailgate? Think about hiring someone to drive your bus for you when you’re tailgating. You might even be able to convince a friend to do it for cheap if you provide them with food and fun throughout the day. If you’ve never tailgated in a bus before, we highly suggest giving it a try. Las Vegas Bus Sales sells buses that would be perfect for tailgating purposes. Call us at 877-456-9804 to hear about which buses might be best for you.